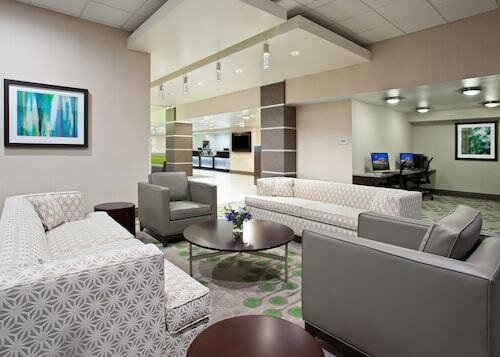 Situated near the airport, this hotel is within 16 mi (25 km) of Duquesne Incline, Market Square, and PNC Park. Heinz Field and Stage AE are also within 16 mi (25 km). Situated in Coraopolis, this motel is within 3 mi (5 km) of Joe Walton Football Stadium, Robert Morris University, and Moon Park. Moon Golf Club is 2.2 mi (3.5 km) away. 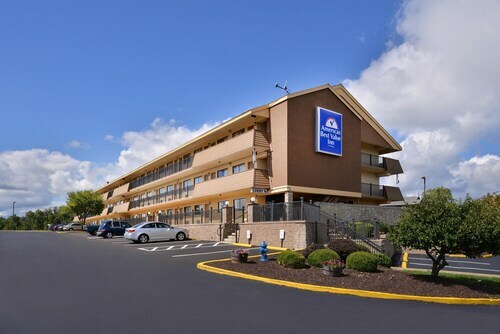 Situated near the airport, this hotel is 0.8 mi (1.2 km) from The Mall at Robinson and within 6 mi (10 km) of Moon Golf Club and Pittsburgh Botanic Garden. Moon Park and Off the Wall Theater are also within 6 mi (10 km). 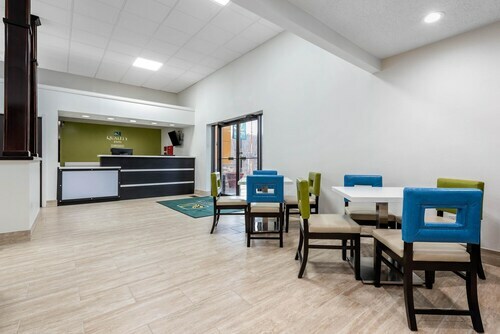 Situated near the airport, this motel is 1.2 mi (1.9 km) from Joe Walton Football Stadium and within 3 mi (5 km) of Robert Morris University and Moon Park. Moon Golf Club is 3.1 mi (5 km) away. Located in Shadyside, this romantic hotel is within a 15-minute walk of Walnut Street, University of Pittsburgh, and Carnegie Mellon University. Cathedral of Learning and Phipps Conservatory are also within 1 mi (2 km). How Much is a Hotel Room in Pittsburgh? Hotels in Pittsburgh start at $53 per night. Prices and availability subject to change. Additional terms may apply. Pittsburgh, Pennsylvania: The Steel City. 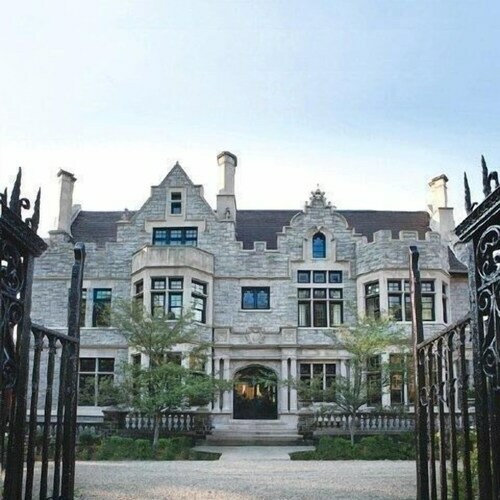 You wake up on your first morning here expecting to witness fiery blast furnaces, tall smoke stacks, and hard-working laborers. You imagine you’ll rub elbows all day long with the type of workers who gave their sweat and determination to help build the infrastructure of American greatness. And you’ll find some of these folks around. Yet, contemporary Pittsburgh is better described as the City of Bridges, a place of romantic waterways, art galleries, and fine dining. Today, the same grit and ingenuity of decades past contribute to an infrastructure of a different sort; education, medicine, technology and finance are the new heart of the Pittsburgh economy. You will be inspired by its transformation from the Smoky City to a picturesque and culturally savvy destination. Instead of counting smoke stacks on the horizon, you’ll sink your teeth into fusion fare and get a cultural fix at local theaters. 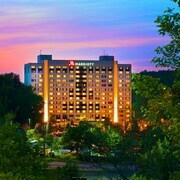 It all begins with a booking at one of our Pittsburgh hotels. 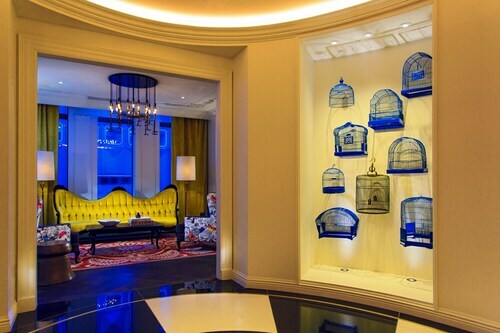 Choose your home away from home now, and then wander wisely. Wyndham Grand Pittsburgh Downtown: Modern accommodations less than a mile from the Andy Warhol Museum will have your excitement popping. Wake up to Starbucks coffee in the lobby, and relax at one of the two hotel lounges at the end of the day. You can swim off that carb-loaded spaghetti dinner at the indoor pool. 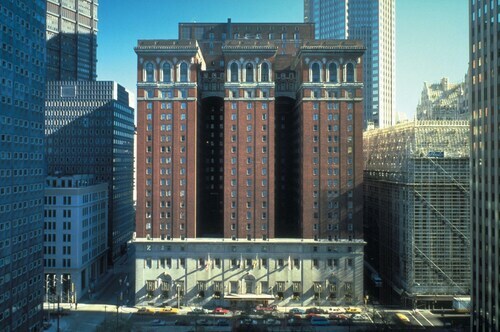 Omni William Penn Hotel: If historic hotels hold a special place in your heart, the Omni William Penn Hotel will be taking up residence near your left atrium soon. 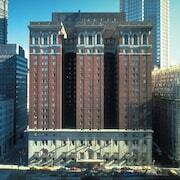 This iconic hotel is just steps from Penn Station, and retains much of its 20th century opulence. Dine beneath a chandelier and sip cocktails in a sophisticated Speakeasy before you retreat to your modern room. 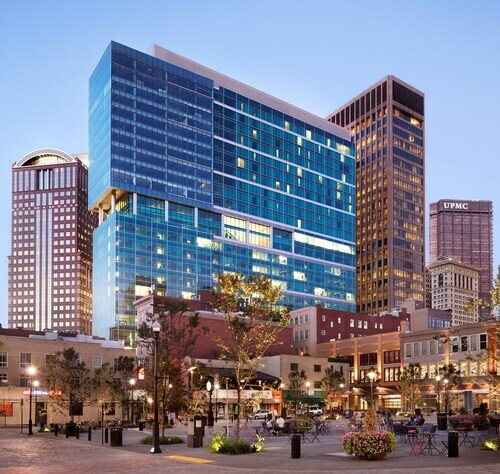 DoubleTree by Hilton Hotel & Suites Pittsburgh Downtown: You want to get around the city with ease, so you’re happy to stay just two blocks from the T light rail. In between bites at the restaurant, you can check out what’s happening at the Consol Energy Center across the street. You grab a canary-colored “Terrible Towel” and throw on a yellow and black jersey. You’d fit right in at a bee colony, but you’re headed for a hive that’s buzzing for a different reason. The local NFL team is playing a home game, and the enthusiastic fans are filling Heinz Field. Many hotels in Pittsburgh are within walking distance of the stadium, where even uninitiated observers can easily get swept up in the excitement of fourth down action. If you’d rather be taken out to the ballgame, and the scent of salted peanuts makes you smile, a trip to PNC Park is up your alley. Stay in the three rivers area at Sheraton Pittsburgh Hotel at Station Square, and you’re just a few miles from the stadium. Watch America’s favorite pastime under the stars, and then shoot the breeze with locals at a downtown bar afterward. You’re dying to investigate all things Carnegie, and the allure of Market Square is just too hard to resist. Whether you stay in the heart of the city or book hotels near Pittsburgh that are near wider open spaces, a trip to Western Pennsylvania opens the door for a lively combination of modern attractions and deeply-rooted traditions. Book cheap hotels in Pittsburgh with Travelocity, and you’re off on the right steel-toed foot. Need insider tips on must-see attractions in Pittsburgh? Check out our Pittsburgh travel guide! The location to the Strip District/Downtown is excellent. There are very good restaurants and museums nearby. 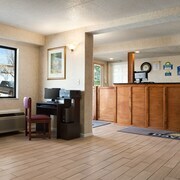 The hotel was great and centrally located to a lot in Cranberry. I found it odd that they only emptied your garbage and gave new towels. If I’m staying 5nights I guess I thought the floors would be vacuumed but that didn’t ruin our experience at all. We would definitely stay here again! We arrived at 8pm. Staff was very welcoming. Breakfast was excellent. Very reasonable price and easy to get to the airport! Overall nice place. Generally clean and quiet. Quite a bit of outside noise due to location.